Do You Need A Cosmetic Dentist in Boynton Beach? Look better, feel better! Nothing is more attractive than a beautiful smile. Are your natural teeth crooked, crowded, or spaced unevenly? Has daily wear and tear left them discolored and broken? Contact your cosmetic dentist in Boynton Beach now! Dr. Salee expertly transforms them with superior quality crowns and bridges. The crown or ‘cap’ fits smoothly over an existing tooth that’s been carefully prepared. A single crown is placed when decay has damaged much of the tooth. Dr. Salee advises placing a single crown when decay has damaged much of the tooth. The crown or ‘cap’ fits smoothly over an existing tooth that’s been carefully prepared — like a sewing thimble slides over your finger to protect it. Like a crown worn on the head by royalty, a dental crown fits securely on top of an existing tooth and helps with both appearance and function. Crowns are often used with bridges to restore lost teeth and support remaining teeth. A crown serves many functions. It’s often used to support a tooth that’s lost sufficient structure to place a filling. A crown protects the structure of a fractured or broken tooth, and strengthens a tooth to accommodate the attachment of a fixed bridge. Full ceramic crowns and porcelain fused-to-metal crowns look like natural teeth. Patients have the option of having gold crowns placed on their back molars, for they add extra strength to chewing surfaces. For superior aesthetics, full ceramic crowns and porcelain fused-to-metal crowns are often used to look like your natural teeth. Gold crowns may be used for extra strength, usually on the back teeth where chewing surfaces are under the most pressure. Losing one tooth can create a larger problem. Many things dental decay, periodontal (gum) disease, injury or accident — can cause you to lose a permanent tooth. Sadly, losing one tooth can cause serious problems for neighboring teeth. Here’s why. A lost tooth changes support and chewing forces. Neighboring teeth will start to shift position and tilt. 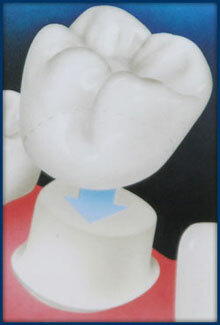 Additionally, the tooth opposite, above or below the lost tooth, may move up or down and out of the socket. Moreover, chewing places undue stress on the shifting teeth. Unless your dentist replaces the lost tooth, more teeth may eventually be lost. With the passage of time, the process can lead to gum disease and a reabsorption of the upper bone and jawbone structure, leaving the jaw weakened. The preferred and prescribed treatment for a missing tooth can range anywhere from a crown and bridge to an implant or removable partial denture. A crown or crowns replace one or more missing teeth, when there is enough tooth structure left to hold. A bridge is a cemented or fixed solution (non-removable, that does not have to be taken out) to tooth replacement that works by anchoring missing teeth to teeth that are on either side. A bridge spans the space where one or more teeth have been lost in the dental arch. Before placing a bridge, the teeth on either side are carefully prepared to serve as anchors (abutments) to hold replacement teeth in place. Afterwards, your teeth look and function normally, without further damage. The bridge spans the space where one or more teeth have been lost in the dental arch. Together, the replacement tooth (or teeth) and crowns are fabricated and placed in the mouth as one non-removable unit called a fixed bridge. Note: When crown and bridge treatment is indicated, a minimum of two appointments are scheduled. It is important that you keep all appointments to prevent any delays in treatment. The first appointment includes a thorough oral examination and evaluation of your dental history. 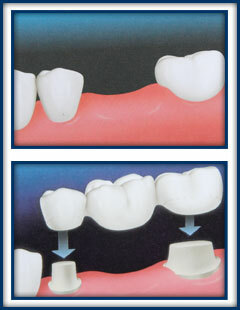 Replacement teeth and crowns are fabricated and placed in the mouth as one non-removable unit called a fixed bridge. We first anesthetize the area to be treated. Next, we carefully shape and contour the teeth to be crowned, to allow the crown or bridge sufficient space for proper fit and appearance. We make an impression of the area and fit the teeth with a temporary crown and/or bridge to protect them until your next appointment. At subsequent appointments, the dentist evaluates the final crown and bridge for proper fit before placing it permanently, and makes any necessary adjustments. Ceramic Inlays and Onlays have become the standard in restoring teeth, when damage to a tooth is much too extensive for a filling, but not quite enough to justify a crown. In many cases, ceramic onlays can be a more conservative option, when compared to crowns. Thanks to great advances in dental ceramics and especially modern dental adhesives, a ceramic onlay or inlay is preferable, where at one time a crown was the treatment of choice. 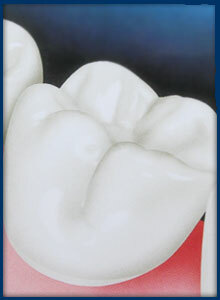 These dental ceramics have become very popular due their high aesthetics and wear resistance. Once cemented to your tooth, these materials actually have chameleon-like characteristics that make them appear to be a natural part of your tooth. Much like a crown, it takes two appointments to have ceramic inlays and onlays completed. On your first appointment, we carefully shape and prepare the tooth to receive an inlay or onlay. We make an impression of the area and fit the teeth with a temporary inlay or onlay that is cemented with temporary cement, to protect them until your next appointment. At your next appointment, your cosmetic dentist in Boynton Beach evaluates the inlay or onlay for proper fit before cementing it permanently. Ceramic inlays and onlays are a conservative, highly aesthetic option that both saves tooth structure and enhances aesthetics. Dr. Elan Salee of Boynton Dental Studio is an expert in placing Cosmetic Crowns and Bridges. With extensive experience in the practice of cosmetic dentistry, he uses the latest tools and technologies in cosmetic dentistry to achieve optimum patient satisfaction and results. For more information on your cosmetic dentist in Boynton Beach contact us today!